Hoboken's Public Contracting Reform laws in conflict with Mayor Ravi Bhalla? Most of Hoboken's government business has moved efficiently ahead as in recent years. Even with Mayor Ravi Bhalla's declaration of war against most of the City Council, a full year and a half before council ward elections, the legislative body passed almost all of what's been placed before it this year. Wednesday, however, will be an exception as the City Council weighs acting on vendors who it inquired about at the earlier May council meeting for alleged Pay to Play violations. Ravi Bhalla and Corporation Counsel conceded the City Council acted properly not approving a $60,000 contract, in part to Prestige Environmental. After the red flag was raised, Ravi Bhalla admitted the City Council had acted appropriately and should contact him if it arises. But two other vendor Pay to Play inquiries raised at the same earlier May meeting have been met with silence from Ravi Bhalla and the Hoboken Law Department. One of the two is being proposed by the Bhalla Administration for a new contract. Those Pay to Play questions are swirling around Boswell Engineering and Lite DePalma Greenberg. 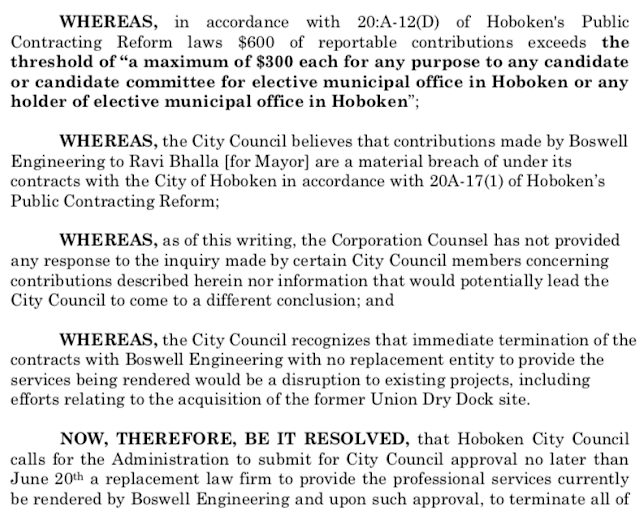 Two council resolutions are challenging both under Hoboken Pay to Play laws. 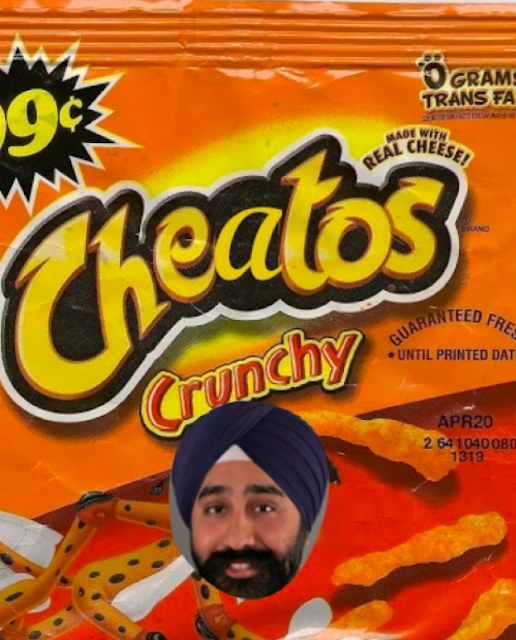 Both vendors are alleged to have exceeded the $300 maximum contributions to Ravi Bhalla and could be deemed ineligible to do business in the City of Hoboken for four years. The City Council resolutions will be in conflict with Ravi Bhalla as his administration seeks to give Boswell Engineering the contract work intended previously for Prestige Environmental at the same meeting. A portion of the proposed resolution on Boswell would halt an additional $40,000 contract the Bhalla Administration is submitting at the same meeting. as the Ravi Bhalla Administration seeks to have approved another contract to the firm, a contributor to Ravi Bhalla. At the previous meeting, the City Council declined to vote for a contract for Prestige Environmental. The vendor sought a portion of a $60,000 contract. In Ravi Bhalla's and his political committee Team Bhalla ELEC reports for 2018, Prestige made contributions of $600 and $1,200 exceeding the Hoboken Pay to Play laws limit of $300. The council red-flagged the matter with Prestige Environmental and others with the Corporation Counsel stating it would be investigated immediately. According to City Hall sources, the City Council has not received any official answer. The Bhalla Administration has instead gone forward with a resolution seeking to award Boswell Engineering with a new contract. more of his contributors violating Hoboken's Public Contracting Reform Laws. Talking Ed Note: Ravi Bhalla is facing a Reform Resistance as its good governance adherents: councilmembers Peter Cunningham, Jen Giattino and Tiffanie Fisher are expected to tackle these sticky issues Wednesday night. This could be the first test of Hoboken's Pay to Play laws going up against the Ravi-Russo Alliance. The mayor's office removed MSV from official releases without comment as these Pay to Play issues have come to light. MSV has broken exclusive stories swirling around Ravi Bhalla and Pay to Play issues back to the mayoral election last year. The truth will be reported.